Isla Blanca: We arrange pick-ups from hotels only in Cancun, Puerto Juarez, & Punta Sam at approx. 5.30am. We only do 8 hour trips as the area is a lot bigger and different fishing spots require a longer boat ride. The area is hardly fished and alot of the water is so shallow that commercial fishing boats can not enter the area, therefore, the chances are greater for the trophy fish. 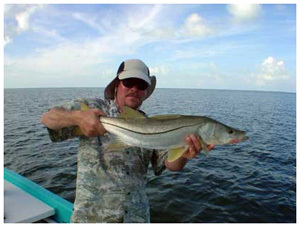 We fish for: Tarpon, Snook, Permit, Bonefish, Seatrout, Jacks, Snapper and Ladyfish. 2 adults or 1 adult and 2 kids max per boat.